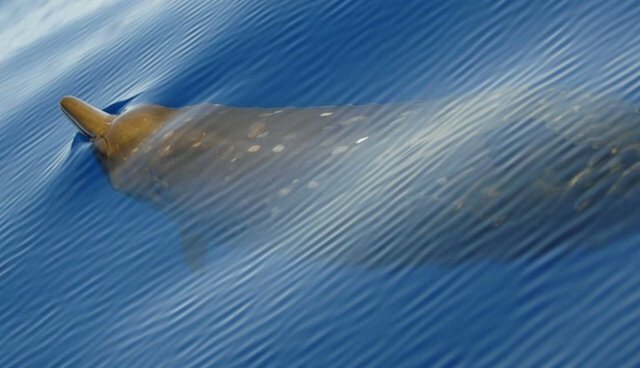 After a search that spanned nearly 50 years, scientists have discovered a new species of beaked whale in the Indian and Pacific Oceans. The species, called Mesoplodon hotaula, is similar to but genetically different than other beaked whales -- a family of cetaceans known for their distinctive long snouts and ability to dive to extreme depths. Researchers studied seven animals that had stranded on island beaches -- the first of which was a specimen found on a Sri Lankan beach in 1963. When they first found the whale, scientists postulated that it was a new species. But two years later, they retracted this, and categorized the animal as an existing species of beaked whale called Mesoplodon ginkgodens. Only now, after DNA analysis, can scientists say that that original whale -- and others like it roaming the ocean today -- is indeed a separate species. The discovery is particularly notable because beaked whales are so elusive in the first place. "They are rarely seen at sea due to their elusive habits, long dive capacity and apparent low abundance for some species. Understandably, most people have never heard of them," said research leader, Dr. Merel Dalebout. No one has observed the species swimming in the wild yet. But scientists say it looks like other species of the beaked whale family, pictured here.